one at Michelangelo Marble & Granite Co., 340 Avenue A South and one at the YWCA Saskatoon, 510 25th Street East, Saskatoon, Parking Stall 30 (in back alley parking lot). 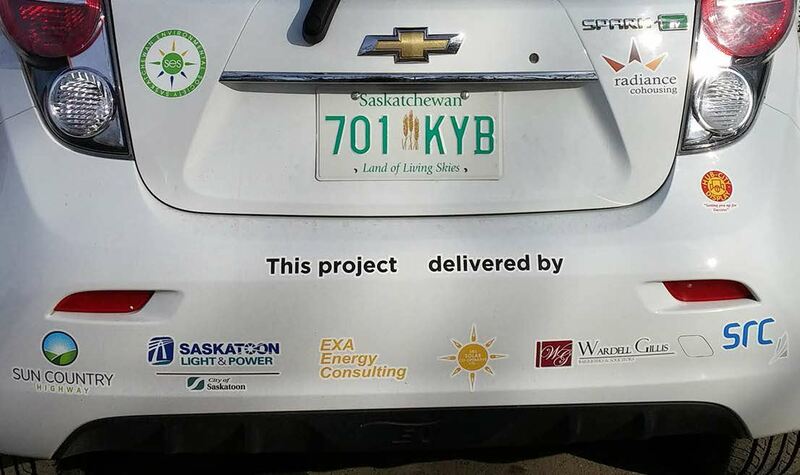 the SES Solar Co-operative Ltd.
with the Saskatchewan Environmental Society (SES) and a team of partners. 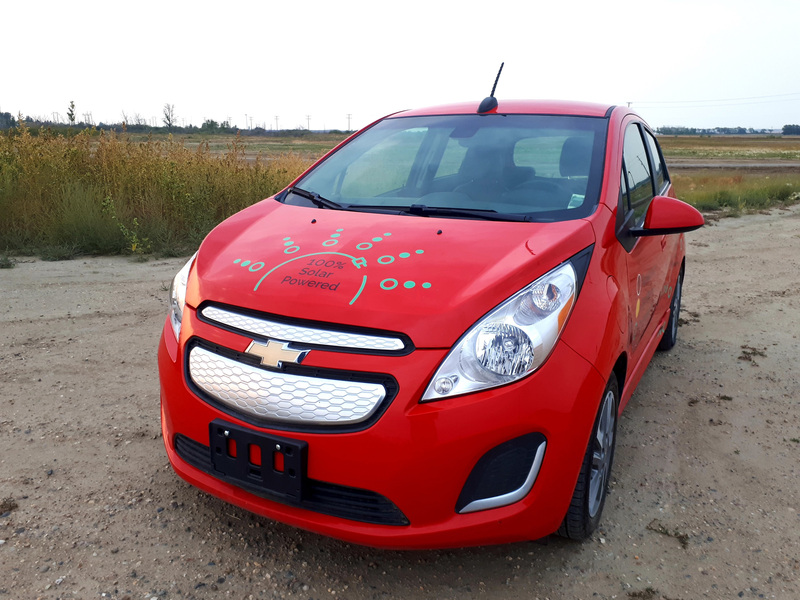 Renewable Rides is an innovative program in which SES is bringing solar-powered electric vehicles to the Saskatoon CarShare Co-operative’s fleet of cars. 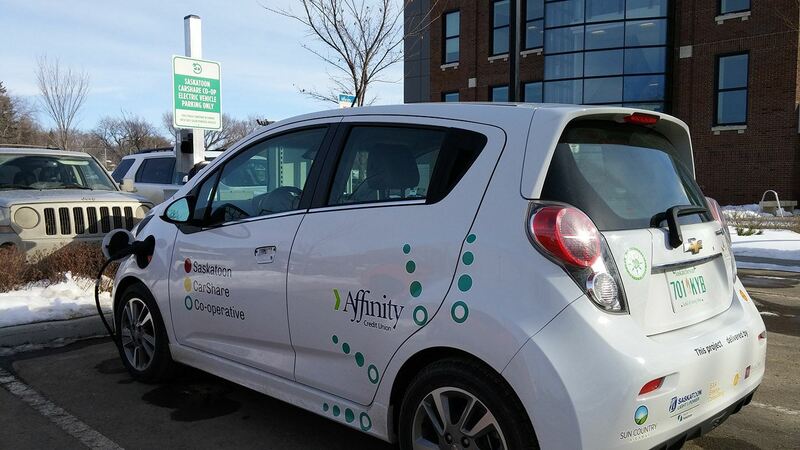 This is the first of its kind in Canada: a car-share program, with electric vehicles, powered by 100% solar energy. An innovative partnership between SES Solar Co-operative, local building owner Montgomery Agencies Ltd. and 4 private businesses at the Haskamp Street site. They receive the majority of their electricity from a near emissions-free solar energy source. The rooftop system consists of 80 environmentally-friendly 280 watt solar panels for a total of 22.4 kilowatts of peak electricity production installed by MiEnergy of Saskatoon. The solar power produced will be equivalent to about 80% of the Haskamp building's total powerconsumption. We estimate the greenhouse gas emissions going into the atmosphere from this building will be cut by nearly 20 tonnes per year. Click for more details and CBC article. 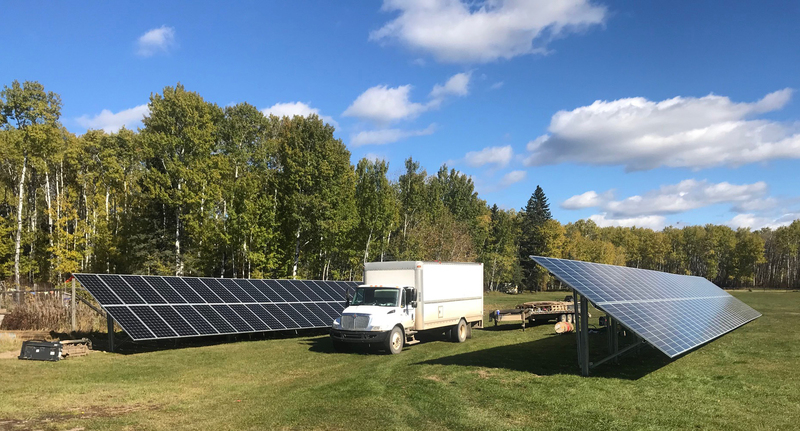 SES Solar Co-op Ltd. (SESSC) in partnership with the City of Saskatoon at their Landfill Energy Project have developed a ground-mounted solar installation to help power the Landfill Gas Generation Station. 80 solar panels were installed by Rock Paper Sun Ltd. SESSC and the City of Saskatoon each own 40 of them. Each panel has 345 watts of capacity. Click for more details. As well 2 solar tracker systems are on loan from Saskatchewan Polytechnic. This is currently the largest solar installation in the Saskatoon Light and Power district and the second largest installation in Saskatoon. The estimated electrical production from the system is 33,000 kilowatt hours per year. Click for more details. 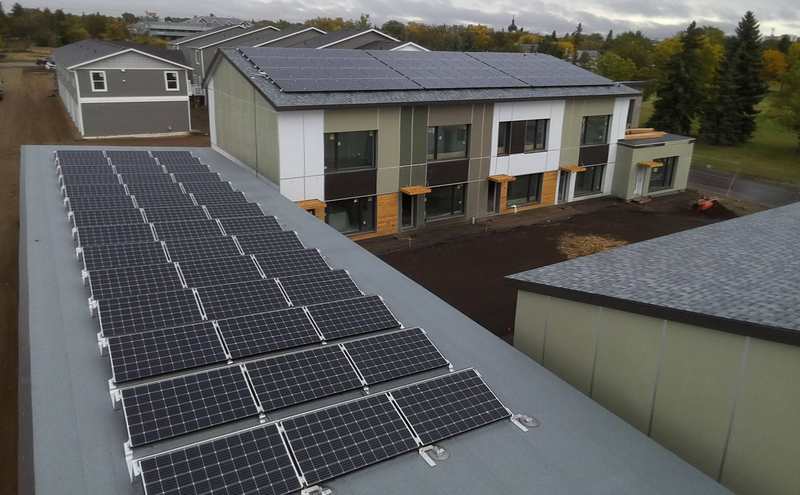 90 solar panels for a total of 27.5 kilowatts were installed by Suncatcher Solar Ltd. on the roof and front awing of the Two Twenty Building at 220-20th Street West Saskatoon. The SES Solar Co-operative Ltd. is the first co-op of its kind in Saskatchewan. Southern Saskatchewan has an outstanding solar resource, with more hours of sunlight than anywhere else in Canada. Saskatoon, Saskatchewan sees an average of 2267 hours of bright sunshine every year. It is time to start utilizing that renewable resource in the production of electricity. 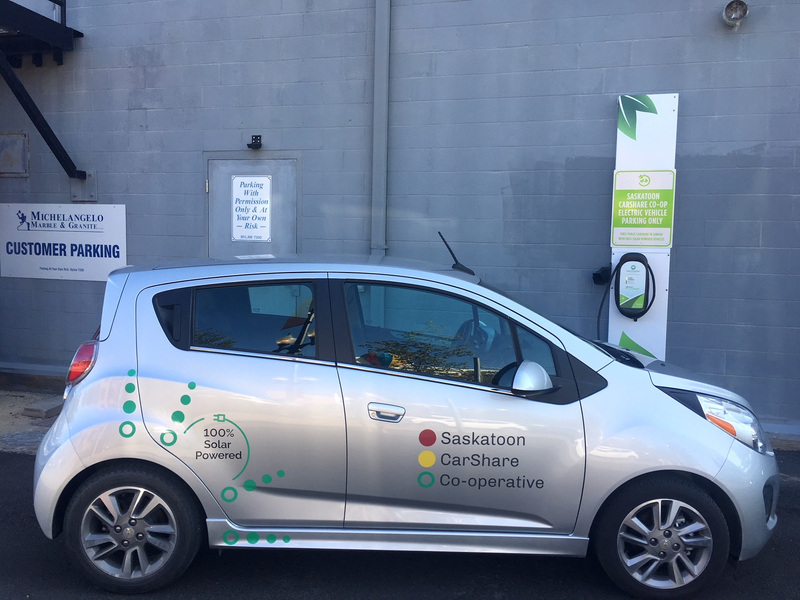 The goals of reducing greenhouse gas emissions and building a renewable energy future for Saskatchewan need to become a top priority in the province's communities. That is why it is not only important to launch Saskatchewan’s first solar power co-operative, but to replicate it many times over in other communities across the province! Based out of Saskatoon, the SES Solar Co-operative Ltd. has carefully developed a legal structure, a set of bylaws, and a business model that can then be followed – and modified as needed – by future renewable power co-operatives. Our goal is to ultimately see dozens of renewable power co-operatives across our province. Coal continues to dominate Saskatchewan's electricity grid, with over half of the province's electricity coming from coal. Carbon dioxide released from coal burning will remain in the atmosphere for at least 100 years. 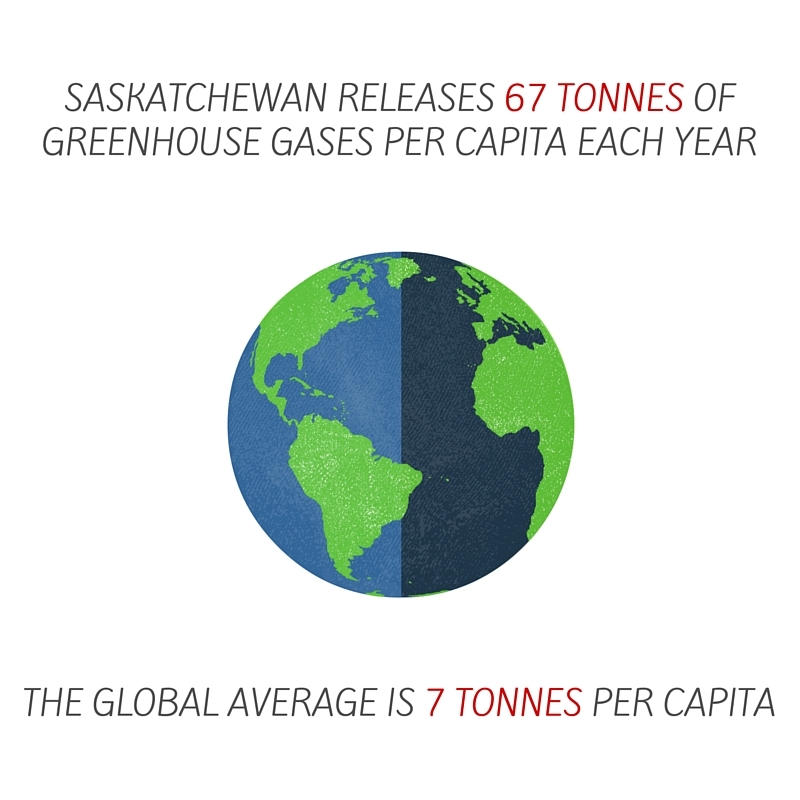 Although Saskatchewan is home to only 3% of Canada's population, the province is responsible for 10% of the country's greenhouse gas emissions. By becoming a member of the SES Solar Co-operative Ltd., you can help reduce pollution and greenhouse gases. Invest in renewable energy in Saskatchewan. To learn more, read our frequently asked questions. 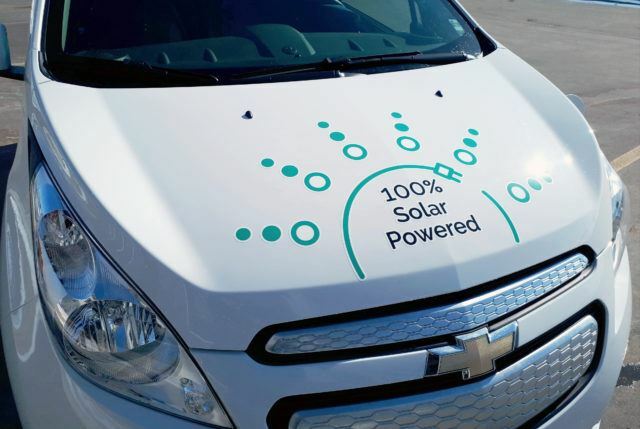 Want to learn more about the SES Solar Co-operative Ltd?